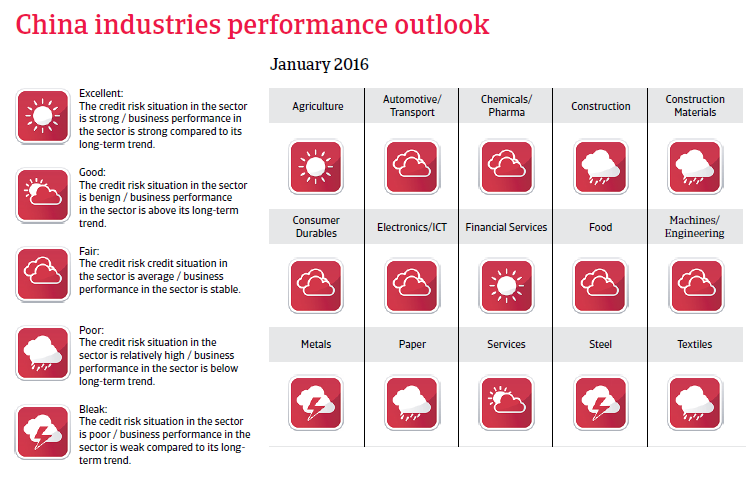 Economic growth forecast to slow down to 6.3% in 2016, but no hard landing expected for the time being. 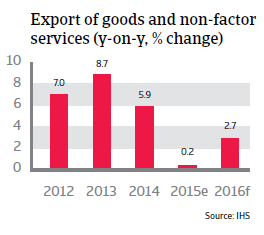 The massive stimulus package since 2008 has led to overcapacity in many sectors (especially construction, steel and metals, shipping, mining, paper) and high indebtedness. Consequently, many Chinese businesses are currently reluctant to invest. Listed companies, state-owned businesses and foreign-owned enterprises still benefit from stronger support from banks and shareholders. More caution is recommended when dealing with small and medium-sized private businesses, as many of them - even those active in well-performing industries - often suffer from limited financing facilities. The current economic slowdown has generally led to increasing overdue invoices and insolvencies, and businesses requesting longer payment terms, – a trend that is expected to continue in 2016. Overall, the domestic political situation in China is stable, with the Chinese Communist Party (CCP) firmly in power. President Xi Jinping continues to consolidate his power within the CCP and is seen as the most powerful Chinese leader since Deng Xiaoping. The government under Xi has launched a campaign against corruption and extravagance by top party officials, leading to the conviction of several prominent party members. To prevent any major social unrest, the administration’s main aim is to preserve economic growth, create jobs and develop a public welfare safety net. While it has become more difficult to prevent public demonstrations and criticism of the government (via the internet), internal stability is strengthened by the fact that the living standards of many Chinese people have improved: GDP per capita has risen from USD 847 in 2000 to USD 7,645 in 2014. Nevertheless, there is considerable income disparity between the rural and the urban population, and between the coastal provinces and western parts of the country. In recent years, there has been growing social discontent in several provinces, fuelled by corruption in local government, environmental problems and weak protection of property and land rights. So far, protests have flared up only locally and have been swiftly contained by the security forces. Sino-US relations are generally stable, but Washington has become increasingly concerned about Beijing’s military build-up: especially the potential for China’s naval and air force to strengthen their power projection in the Pacific. A shift in US defence strategy, with a renewed focus on Asia-Pacific, is motivated mainly by Washington’s aim to balance China’s rising power in the region. One issue is Beijing’s increasing assertiveness in the South China Sea, where it claims sovereignty over a large U-shaped area. This has brought China into dispute with several neighbouring countries. Since 2013, tensions with the Philippines and Vietnam, over disputed islands in that area have increased. In 2015 massive land reclamation measures by China have raised concerns in the US over the freedom of navigation in the South China Sea. Relations with Japan remain burdened by the conflict over the Senkaku/Diaoyu islands, which are claimed by both sides. After increased tensions in 2013 and 2014, Sino-Japanese relations have improved somewhat after several high-level talks held in 2015. 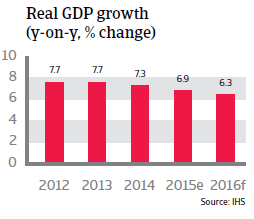 China’s economic growth slowdown accelerated in 2015. 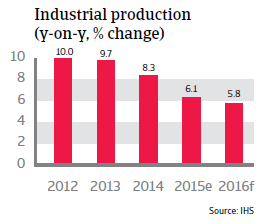 Industrial production and investment growth cooled down considerably, and are expected to decrease further in 2016, leading to a 6.3% GDP growth forecast. The challenge for the Chinese authorities is to implement reforms to reduce the vulnerabilities in the economy and to rebalance economic growth in the medium term - away from investment - and export-and towards more domestic consumption, without overly slowing economic growth. 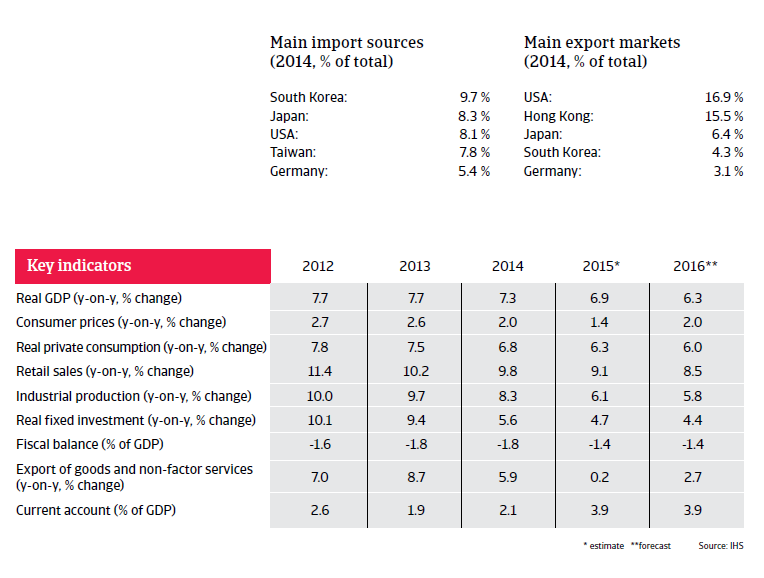 To a certain degree, private consumption growth has started to balance decreasing investment. Since summer 2015 the government has increased fiscal spending to support the economy. At the same time the central bank, the People's Bank of China (PBOC), has repeatedly loosened its benchmark lending rate since November 2014, to 4.35%. Given the modest inflation outlook below 2.0% the PBOC still has room for further monetary policy easing if necessary. After a steep climb during the late spring 2015, the Chinese stock exchange tumbled, having lost 40% of its value since mid-July. The Chinese authorities intervened in the market, spending around USD 200 billion to halt the fall, but to no avail. However, the situation stabilised by late August 2015. So far the impact of the stock exchange slump was fairly limited, given that less than 20% of Chinese household wealth is held in shares, and the part held in shares is fairly concentrated. However, early 2016 Chinese stock exchange suffered another plunge on concerns about the economy, leading to a temporary ban on share sales. In August 2015 the Chinese central bank took the markets by surprise with a devaluation of the renminbi. While it was small in size (almost 2.0%), it sent a shock wave through the currency market, especially in Asia, as fears of the Chinese-led currency war rose. Further pressure on the currency forced the PBOC to intervene heavily in the market in order to maintain the renminbi within its band versus the US dollar. The decrease in the foreign exchange reserves in nominal terms was large, but, in relative terms, and compared to other countries, it was modest. Through the intervention China has shown that it does not wish to wage a currency war. Indeed, the devaluation should be seen as a step towards a more freely floating renminbi as recommended by the IMF. It is expected that the Chinese authorities will be both willing and able to avoid the risk of a shock in either the financial, corporate, real estate or local government segments triggering problems in other sectors. The central government has tight control over the economic and financial activity in the country and runs a small public deficit. Public and external debt is very low and China has huge international reserves. Domestic savings are high and there are capital controls in place to limit the risk of capital flight. This all creates a cushion for the economy in the event of any external or internal shocks. 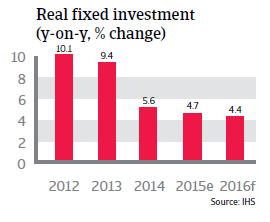 However, further government intervention to boost growth has its pitfalls, as it would revert to the investment stimulus. That would run counter to the rebalancing objective towards a more consumption-led growth and the attempts to manage unsustainably high debt levels of local governments, state-owned enterprises and firms. The tools that the authorities have will most likely allow China to avoid a hard landing, but the high level of total debt will be an obstacle. China has to deal with a huge debt burden, which is the result of government stimulus programmes that started in 2008. The investment boom since 2008, accompanied by high credit growth, has led to high debt levels for local governments, banks and businesses, amounting to about 280% of GDP. The debts of the local government and the banking sector remain contingent liabilities for the central government, as do highly leveraged real estate and related industries (including state-owned enterprises in the real estate sector, as well as in the mining and utilities sectors). The financial vulnerabilities visible in the financial, corporate, and real estate sectors and in the local government are interconnected - a shock in one sector could lead to a chain reaction in another. For instance, investment in real estate has been a major driver of economic growth and a sharp price correction would have an impact on the whole economy via the banking sector and local governments. 62.0% of the businesses surveyed in China (compared to 46.3% in Asia Pacific) reported that domestic B2B customers have slowed invoice payment due to liquidity problems over the past year. In the coming years, the growth of ICT in China is expected to outperform on a regional and global basis. China is a major economic and trading power. Trade successfully with China sets out ten simple-to-follow rules that can help make your trading relationships with China lasting and successful.